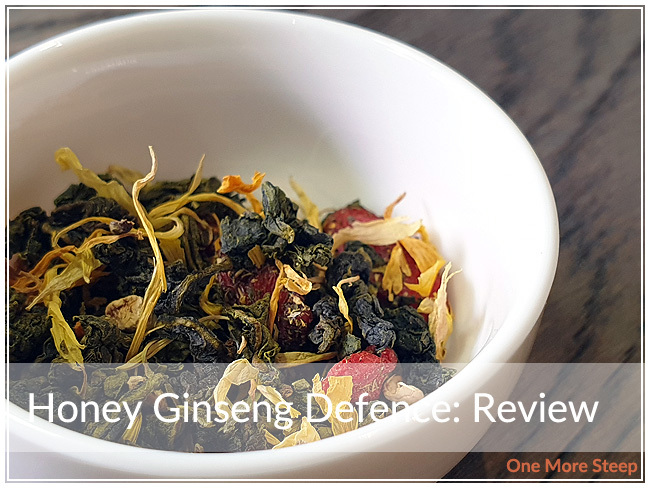 Honey Ginseng Defence is actually a tea that I picked up in January of this year when it first came out. I got to try a little bit in store and decided it was interesting enough to buy a little bit to steep at home. As always, DavidsTea’s loose leaf tea comes in silver foil bags that are resealable. If you buy the tea online, they come in heat-sealed, resealable bags but if you buy it in store, the bags aren’t heat sealed. Makes for easier opening, in my opinion. The aroma of Honey Ginseng Defence is primarily that of a berry fragrance, with some floral and honey notes. Honey Ginseng Defence consists of oolong tea, goji berries, ginger, marigold blossoms, ginseng, natural honey and goji berry flavouring. DavidsTea recommends steeping Honey Ginseng Defence in 90°C (195°F) water for 4 to 5 minutes. I followed the steeping instructions and my initial steep of Honey Ginseng Defence was for 4 minutes. Honey Ginseng Defence steeps to a light yellow (honey yellow…?). There’s some sweet floral fragrance notes, and a hint of fruitiness. The flavour is primarily floral and honey sweetness, although I can taste a bit of the ginseng, a hint of ginger, and the creamy oolong base. While I do know what goji berries smell and taste like, I don’t really get a goji berry flavour from the tea – the fruitiness that I do find reminds me more of mixed berries (raspberries, blueberries, etc.). I resteeped Honey Ginseng Defence twice, adding an extra 30 seconds for each subsequent steep. 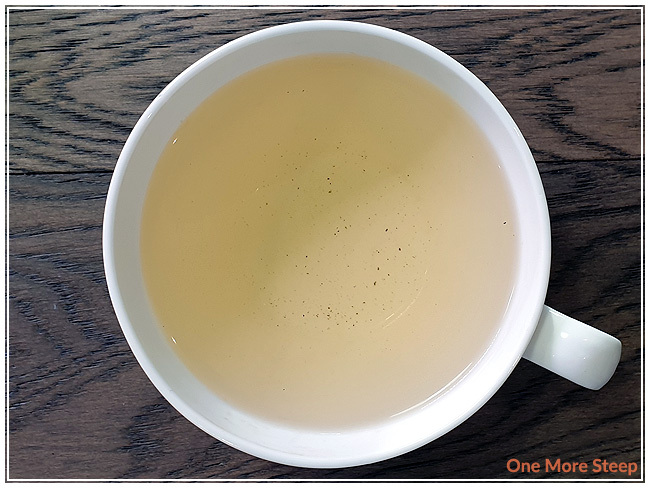 I found by the second resteep, the flavour of the tea was primarily that of the oolong base – which has some great buttery and creamy qualities to it. 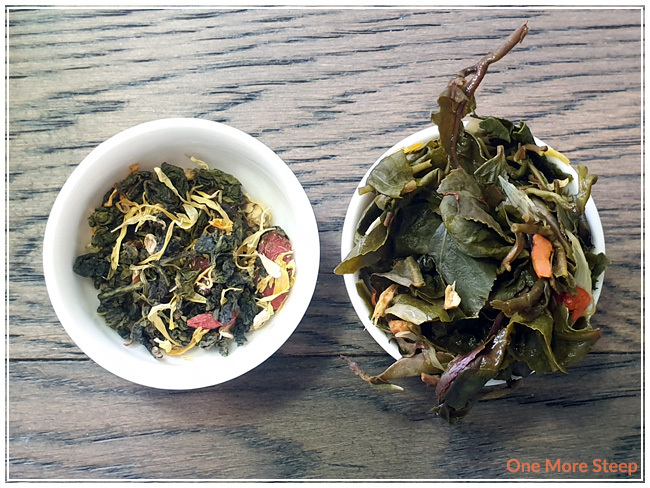 If you love oolong, you’ll probably enjoy resteeping this blend. If you were more of a fan of the tea as a blend, you may find it to be a bit more ‘meh’ to your liking. 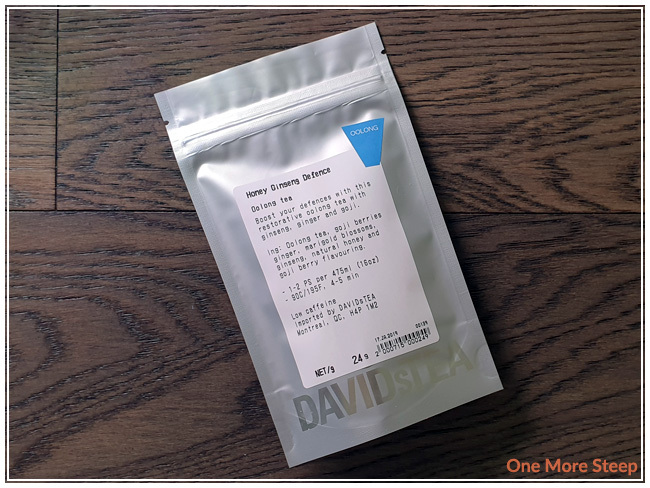 I liked DavidsTea’s Honey Ginseng Defence. I thought that the blend was really pleasant and was quite tasty. 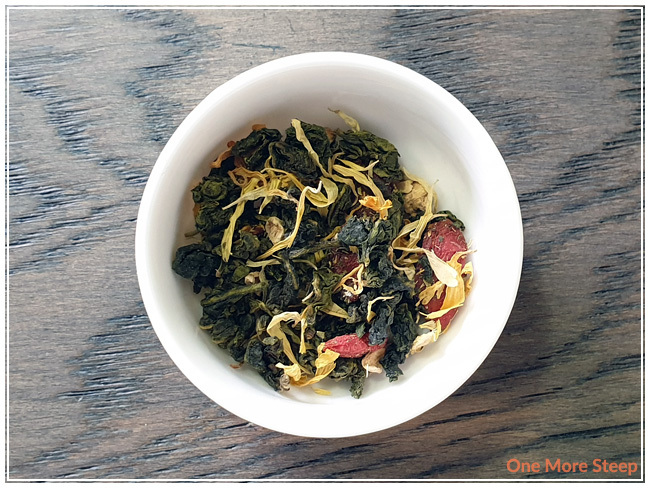 I’m a bit disappointed that the tea as a blend didn’t resteep that well, but I’m glad that the oolong had some nice quality to it and it allowed for a tasty steep. I wish that the tea had more of a goji berry flavour to it, despite having both goji berries and the flavouring of goji berries, I found it to be on the lacking side. That said, the ginseng was noticeable, as was the honey, so it still made for a nice cup of tea.